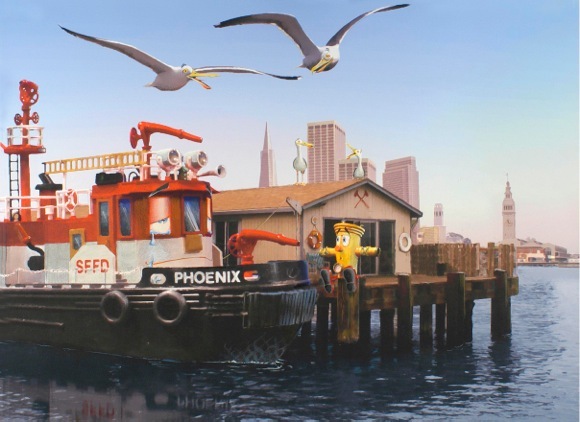 Frankie and the Phoenix just passed the time away At engine station 35, along San Francisco Bay A hydrant that was portable and a fireboat with pride The two were waiting for the chance of working side by side. But City Hall told the Phoenix it's time she should retire We've got enough equipment here for fighting any fire. Mayor Feinstein stood her ground and strongly disagreed This fireboat must keep afloat for future times of need. 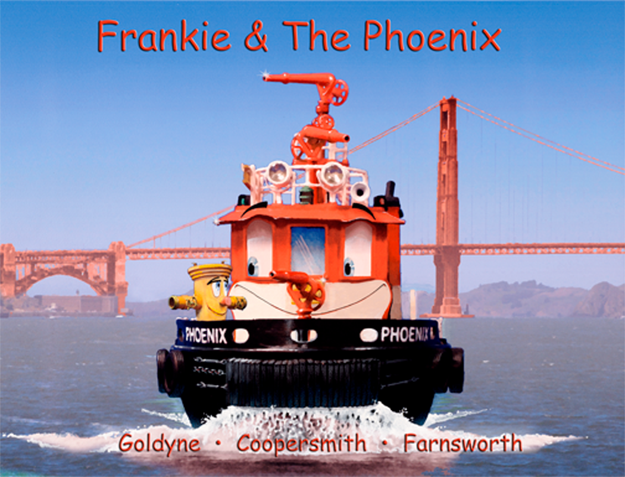 Frankie and the Phoenix just waiting for the day To put some big time fires out along San Francisco Bay. 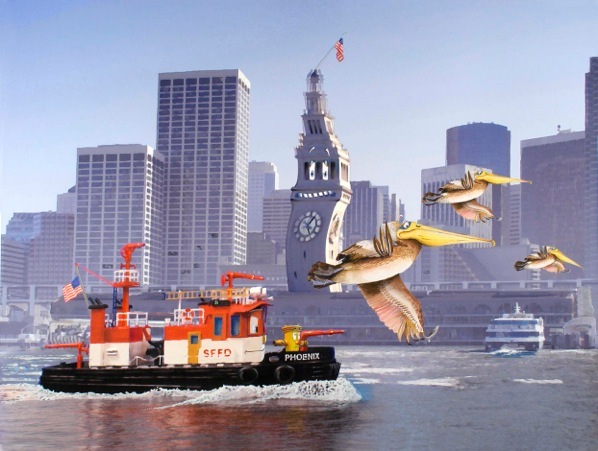 And just when everybody thought that City Hall was right The ground beneath San Francisco shook and all the birds took flight. Walls came down throughout the town; it was a scary scene! And a blazing fire grew higher and higher near the Marina Green. When firefighters came to douse the flames, they gave a mighty sigh Because underground, the water mains had cracked and now were dry. No water for the hoses, no water in the mains And now the whole Marina could all go up in flames! A call to station 35 and help was on its way. 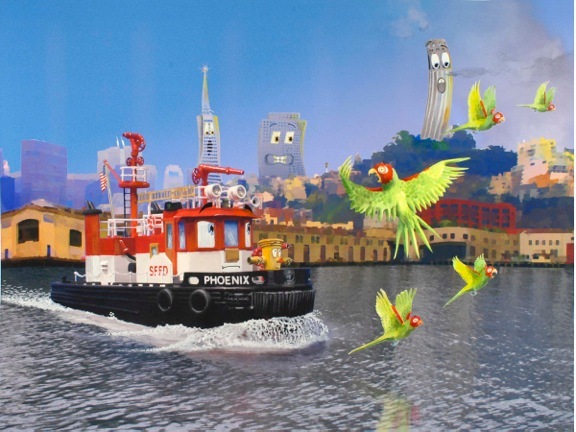 The Phoenix sped along the docks of San Francisco Bay. She pulled up to the seawall about two blocks from the blaze, Then she and Frankie got to work to try and save the day. The Phoenix quickly started pumping water from the Bay With hoses run through Frankie's arms to firefighters blocks away. 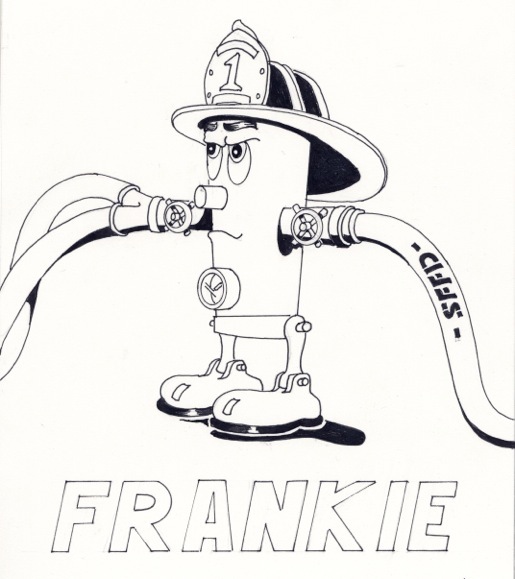 With Frankie's special hoses enough water was supplied And the whole Marina gave a cheer as the fire slowly died. 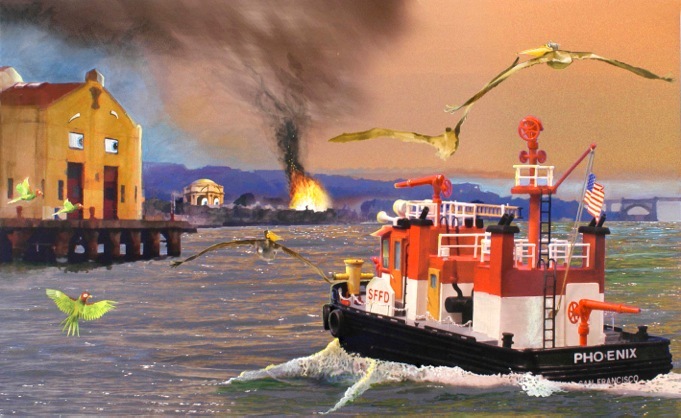 Frankie and the Phoenix, the heroes of the day Just put the biggest fire out along San Francisco Bay Frankie and the Phoenix, both are doing fine Because they saved the whole Marina in the quake of '89! Frankie & The Phoenix 4G Publications, March 2006; second edition November 2012. 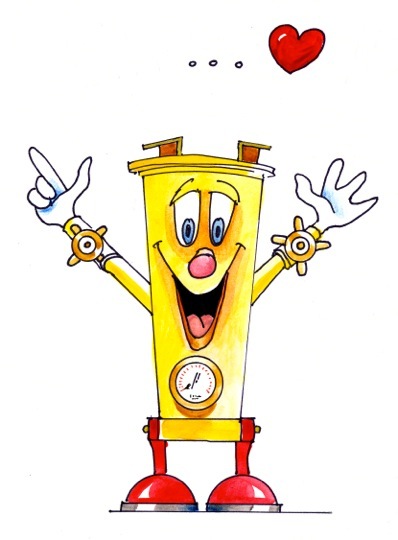 Hard-bound, 32 pages, 15 illustrations, size: 9 3/4" x 12 1/4", $16.95. 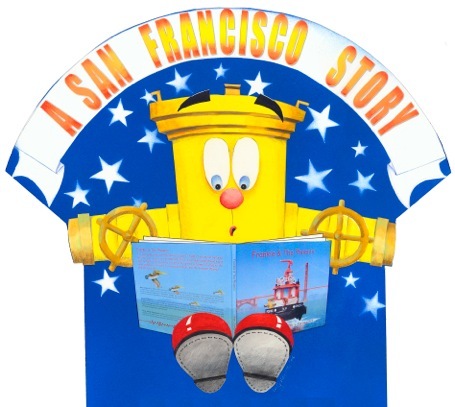 A limited commemorative edition of the children's book (Indigo Press - 9.5" x 12" ), Frankie & The Phoenix, was printed in conjunction with the 15-50-15 Day event in 2004 in the Marina District, San Francisco. 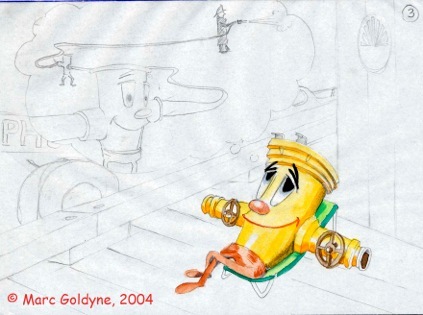 Concept and illustrations by Marc Goldyne, story by Nancy Coopersmith, with computer design by Don Farnsworth (Magnolia Editions). 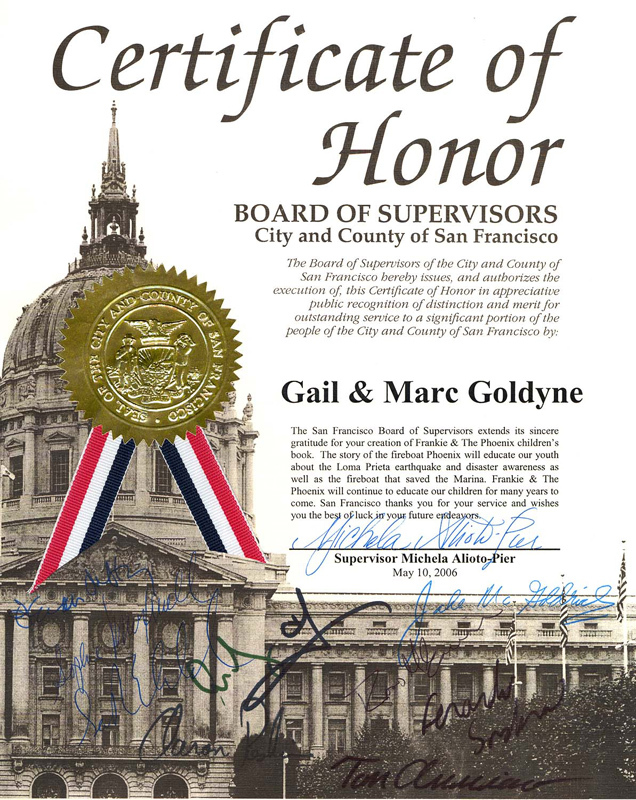 The introduction is written by Senator Dianne Feinstein and the foreward is written by SFFD Chief Joanne Hayes-White. 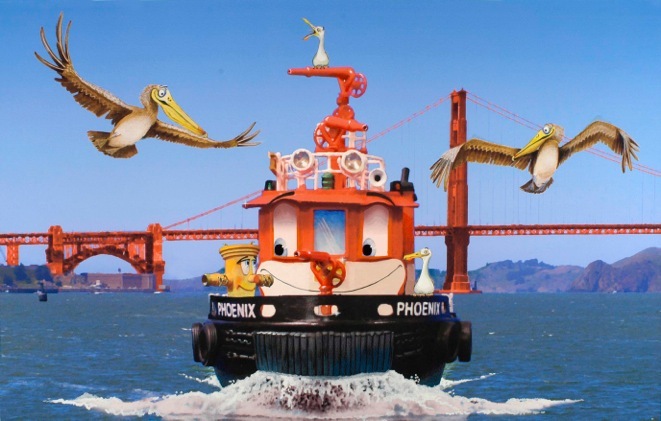 The book tells the true story of how the Fireboat Phoenix, a target of budget cuts until Senator Dianne Feinstein (then SF supervisor) spearheaded its permanent funding, along with the portable fire hydrant system (invented by SFFD Asst. 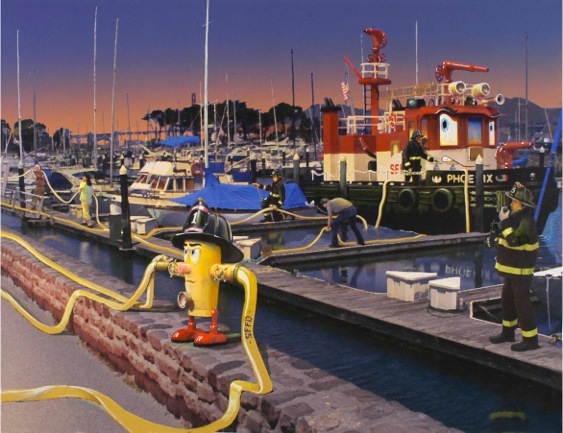 Chief Frank Blackburn) saved the San Francisco Marina following the Loma Prieta earthquake in 1989. The illustrations are mixed media: original drawings, cityscape photographs, photoshop manipulations, finalized as a monoprint with hand watercoloring. SFFD Station 35, Pier 22 1/2 The Embarcadero, S.F. All Contents Copyright © 2004- - FrankieAndThePhoenix - All rights reserved.